Depending on where you live in Illinois, you are probably in zone 4 or 5. Your mandevilla may be turning yellow from lack of nutrients, heat stress or disease. The brown spots on the leaves are a leaf spot disease that is caused by a fungus. It is very prevalent this summer in hot and humid weather. You can treat the plant with a fungicide to keep the disease from spreading and remove any fallen leaves. Yes, you do have to bring your plant indoors for the summer. Read the above article for wintering over your mandevillas. I just purchased my first Crimson Mandevilla from Lowes, and I was NOT told that it is a annual, I planted this beautiful plant this August, and I have wonderful results. It is climbing up the trellis, just like I wanted it to. Now that winter is coming fast, I looked up this web site and discovered that I should NOT have planted this wonderful plant. No, I wish I could tell you that you can but mandevilla is a tropical plant hardy in zone 9-11. Sorry. I have several Mandevilla’s 2 of them developed spots on the leaves,they turn yellow, some of the leaves look like they are burned and they fall off. I dont know if I have Spidermite or some other disease, can you help me. There’s not enough information for me to determine what the problem is. sorry. It doesn’t sound like spider mite. It’s possible that your mandevilla has a leaf spot disease-which is prevalent in wet, humid conditions. Another possibility is heat scorch. Hot weather can scorch the leaves. Take a specimen to your local extension office, they may be able to identify the problem. My Mandevilla has what appears to be spider mites or some type of pest that is bright yellow & appearing on the stems of it. I seen where you suggested to use a strong spray of water but I was wondering if there is a pesticide I can use for tropical to stop them from coming back. I live in Ohio & will soon be bringing all of my tropicals in for the winter & I don’t want the rest of them to get these on them. Any & all suggetions will be appreciated! You may want to use a systemic soil treatment such as Houseplant Insect control (Bonide). It renders the whole plant poisonous to insects. Follow label directions as to use. It might have been the timing as to when they were cut. I don’t know what else they might have been doing. Miracle Grow Bloom Burst. I live in the Pittsburgh PA area where this summer has been terribly humid. Is it necessary to “pot them” and bring them in for the winter or is there some way I can prepare them for the cold of winter? Mandevilla is a tropical plant and will not winterover outdoors. You will have to pot them and bring them indoors. Thanks for all the wonderfully concise information! I just picked up two mandevilla for half price at a local greenhouse. I live in the Chicago NW Suburbs, so I will overwinter the plants. It’s the last weekend of July. Should I leave the plants in the pots in which they were purchased, or put them in new, larger pots? The “Tango Twirl” (Monrey) is in a 1 gallon pot, with a 2′ bamboo teepee. The “Sun Parasol” (Sunparacoho) is in a smaller 8″ pot, with two visible plugs. Would it be advisable to divide it now, or wait until Spring? If I am to divide them, what size pot should I use? To repot or not repot that is the question. You may still have about 2 months of growing season for your mandevilla. Chances are that they are potbound and could use a repot. A pot bound plant will dry out and roots will heat up much faster during the hot summer. So, I would replant it in a slightly larger container (1″) larger container adding more fresh soil. This will help keep the roots moist and cool a little longer . It will give the plant more room to grow and ultimately a healthier plant. Gently knock out the whole root ball and replace it in a larger pot. Do this in the evening or on a cloudy day. After repotting keep the plant in shade for a few days then move it back to sun. Be sure it gets plenty of water. It’s easier to leave it in the pot so you don’t have to dig it up in the fall. What a wonderful website! And my first-ever Mandevilla is the best flowering porch plant I’ve ever had! I’ve spent an hour reading all the Mandevilla posts, and have learned so much. I live in a second floor apt, and our screened-in porches are wood lattice work up to about 4′ high. The plant is twining in the lattice work (with gentle nudges from me), and blooming beautifully. It’s still in the plastic pot I bought it in, and I water it every morning, twice a day when it’s over 90. I’m in Indianapolis and we have hot, humid summers & cold winters. I was concerned about the yellowing leaves, but having read these posts, I see that is normal. I plan to over-winter it indoors in a dormant state, then re-pot it and enjoy it again next year. I also plan to buy two more next spring! Thank you so much for your excellent growing advice and for this wonderful website! Thanks for the comment! Glad I could help. Are the tubers on my Mandevilla roots root rot? If so, can the plants be saved? Will they infect a healthy plant if I plant a new plant in the same pot as my infected plant? I live close to the beach in central California. We get a lot of fog. The plants are in plastic pots on a west facing deck. They were getting yellow leaves and not doing very well so I decided to repot them. I would plant the new plant in fresh soil. Whatever condition caused the first mandevilla to rot may be in the soil and can spread to the healthy plant. Make sure you plant in well-drained soil. I live in Southern California, I just found your site and never knew how to proporly care for my Mandevilla. I water it about twice a week when the soil drys out. During winter, I did not take it in and now it seems to be loosing a lot of leaves branches are getting bare but still has flowers. I just put it in a larger pot. Is there anything else I can do to save my plant. Since you are in So. Cal. there is no need to bring your Mandevilla indoors. I may be dropping some leaves from cold temps. It may have needed the repotting. Trim you mandevilla back by 1/3 and once you see new growth, start fertilizing the plant. I have taken my 2 mandevilla plants to florida with me.I live in NY in the summer,they have done nicely all winter.I have not had any flowers on them since i came down in oct .I also now see one of them has some black on there leaves.What can I do to save them? I have grown them since they were about 2 ft.
Do the leaves have black spots or a black film on the surface? Check the underside of leaves for signs of insects, if the black/brown spots are bumpy and can be scraped off, then it could be scale. If the spots are circular, angular or water soaked then its a bacteria or fungal leaf spot. I have two Mandevilla that I am overwintering together in a sunny window. The red one was overwintered last year as well but took a long time to bloom this summer. It is looking very good with nice green leaves and signs of new growth. The pink one was new last summer and it has lost a lot more leaves but has more new vining growth (of the straggly variety). I understand it may be time to start with some light fertilizer and trim back some old growth. Do they need different types of care (i.e.different fertilizer) since they are in such different conditions? And how soon is it advisable to start fertilizing to encourage quicker blooming? And since they need growth before they can bloom – is a 10-10-10 fertilizer best? At what point should I switch to the higher phospherous fertilizer for blooms? I live in Northeast Nebraska (zone 4) and am planning to start putting them outside on warmer days to acclimate them to the outdoors. Hi, and Happy After New Year’s. I followed your instructions and put my mandevilla in the garage when the temperatures first started dropping last fall. She actually bloomed into the winter — in the cold garage. I eventually brought her in the house and set her up in an East-facing bathroom window. She’s dropped some leaves, but is now getting new green shoots (on old wood, I didn’t trim her yet), and she has some very small green-dot-sized growths at the base of the stem. I’ve read your posts and I’m not sure if I should start feeding her yet. She’s been drinking lots of water (a good drink every 6-10 days), but I’ve not fed her yet. Also, did I get it right? I should trim her soon … but when? Thanks for any help you can offer. By the way, we live in Maryland. Thanks for all the info you post on this site. Yes, you got it right. Since your mandevilla is growing, I would feed her a weak 1/2 dose of fertilizer and increase the dose when its ready to go outside. Because it is putting on new growth, trim the old leggy winter growth. So appreciate all the good dependable info you share. I have a variety that is unusual and i love it and want to keep it ..can’t afford to replace, lost one of my 4 but not the 2 special doubles that are spectacular. Will follow directions carefully to keep them healthy. Thank you and keep up the fantastic work! Thank you for the kind words Taffy. I’m so glad you are having great success with your plants. I live in northern Michigan. My boyfriend bought me a beautiful Mandevilla in a hanging basket. This is the second winter I’ve brought it inside. Both years many (but not all) of the leaves turned yellow and dropped, and it produces long off-shoot vines (which does not happen in the summer). It looks pretty sad – not a very nice-looking house plant. However, last summer it did well when I returned it outside. What can I do make the plant happier and nicer-looking during the winter months? I do keep it pretty cold in my house (57 degrees) when I’m not here (which is often). When I am home I only heat to 64-67 degrees. It hangs in a nice bright spot (indirect light) and I water weekly. Also, should I keep or trim the off-shoot vines? It made the plant look so scraggly last year I trimmed them. Mandevilla is a tropical plant and will require warm, humid conditions with lots of sun (a greenhouse would help). The yellowing and leaft drop is normal. Eventhough you might think it is getting a lot a bright light indoors it is only a fraction of what it gets when outdoors. Basically, you’re trying to keep the plant alive during the winter and then let it do its thing outdoors during the summer. You can cut back the straggly winter growth in early spring (like you did the previous year). Spring is just around the corner- before you know it you can set your mandevilla outdoors. I live in South Florida and my mandivillas have stopped growing and have shed their leaves. Should I prune them and set them aside for the winter months? Please help. These plants were beautiful. It sound like your mandevilla has gone dormant. If they are in a container, move then to a sheltered area(garage) to get them through the coldest part of winter in Florida. If in the ground, protect the roots by mulching around the roots. You can prune it in late winter/spring when its ready to grow again. I live in central Michigan. My mother purchased this plant for me this summer and I kept it outside in patial sun. Was gorgeous all summer and fall, the vines even attached to my lattice! As it got colder, I trimmed the vines from the lattice and brought it inside. I am wondering if I should put it in a larger pot and add some bamboo trellis for it? It is about 20″ tall and still looks great, should I prune it? Don’t repot it until late winter/spring. You can trim the vines and add a trellis to make it more manageable indoors. We purchased some large Mandevilla plants last spring which flourished until the weather turned cold here outside Boston. I would like to overwinter them but have very little room for them where it’s sunny in our house. They spent the season in the large (maybe 7-8 gallon?) pots we bought them in and the roots now pack their containers. How will they fare if I cut the root balls back to, say, 2 or 3 gallon size (in addition to pruning back the stems as you have advised others) in order to be able to manage them overwinter in the house? Thank you for all you informative answers on this site! I live in Southern California and our Mandevilla was thriving all summer then about a few weeks ago the leaves started to turn yellow from the bottom up and wilting. From reading all your great answers it appears I may be overwatering? I water it every 4 days or so and it has a saucer. I recently started fertilizing, but is this the resting period even here? We love this plant and want it to survive. What do you suggest? Loving this site. Have learned a lot; unfortunately just today and I may be too late! I am in Massachusetts and I have two Mandevillas of different types (not sure what types tho) and we got a heavy freeze last night. I did cover them, and they’re definitely still a live, but I’m not sure for how long. I decided to bring them in this morning and I need to cut them down (both really big) and since I don’t have anywhere in my house to put them (only one south facing window and all my regular houseplants are in it), I’m thinking I should try to overwinter in the basement. Temp usually runs in the upper 50’s to low 60’s (we have a kitty) down there and somewhat humid at times (constantly run a de-humidifier). Do you think I can box them up and keep them that way? Should I wait ’til the leaves drop? Should I fertilize at this point or just water a bit, pack ’em up and check them/ water them montly as previously stated? Thanks so much! When you run out of run in the house, you can winter mandevilla in the garage or cool basement with temperatures around 45-55F in a dormant stage. Cut it back to about 12 inches above the soil line. Treat for insects if any. Keep it dry but not completely dry. Check periodically (one a month) for soil moisture. You can wait for it to drop its leaves or just cut them off either way. No fertilizer at this point. I live in Phoenix, AZ. where summer temp’s reach 110F in the summer. Can the Mandavilla take that kind of heat even if it is in the shade? Mandevilla is a tropical plant and can tolerate high temperatures as long as it has enough moisture. When temps reach 110F move the plant to shade for some relief and water deeply. Yellow leavesI live in the Orlando area and planted my mandevilla this spring. It has been doing beautifully, but all of a sudden it started turning yellow and looking like it is dying. All my other flowers and plants in the same bed look great. Have I done something to kill it. How can I tell if it is still alive or just going dormant. It has started cooling off in evenings and we have had some nights in the 50s. Some of the reason for yellowing leaves & leaf drop is the possibility of winter dormancy-the cooler outdoor temperatures(below 50F), shorter days will slow growth causing seasonal shedding of its older leaves. Drought stress, overwatering and underfertilization can also cause yellowing/leaf drop. Also check for insect infestation (scale). It’s too early for your mandevilla to go dormant. I live in NH and purchased a Pink blooming Mandevilla plant this summer. I took my plant indoors when temps dropped below 40, I have it in our living room near a window, which is always around 50-55 degrees, there are no leaves left or flowers, I water it occassionally when it starts feeling dry? Will my plant survive the winter inside? It sounds like the plant is dormant and if you maintain cool temperatures, it will stay that way through the winter. You can also move it to a cool, dark room until early spring. Keep it on the dry side. Well, I guess you could say I am on a “Save the tropics” mission. I live in southern NJ (zone 6) I have 2 mandevilla and 1 night blooming jasmine. All in pots and growing beautifully. Just brought them indoors. I have placed them in our garden tub, which is never used (to keep them away from cats). There is a skylight above the tub, but I am sure they will require some sort of grow light. Can you suggest a type or wattage of a grow light which might help them remain thru the winter indoors? I have read about so many different types…I am totally baffled! And is it possible for them to remain in bloom during our winter months, indoors with an artificial growing light? Or am I just wishful thinking? Your input is greatly appreciated. Thanks. I’m not sure what type of grow light either, it is confusing. Any grow light will help improve plant growth. For optimal effect, make sure you have the right distance between the plant and light. Mandevilla require full sun outdoors which cannot be duplicated indoors but given enough light, it may continue to bloom lightly during the winter. The important thing is to keep the plant healthy and “alive” during the winter months so that when spring comes, they can return outdoors and flourish. Ive read many of the mandevilla posts and have a few questions – I live in Chicago and want to bring my 2 plants inside. When you say to prune them to half the size, is there anywhere on the plant I should cut in particular? I also don’t know what you mean when you say 10-20-10 for fertilizer. I am obviously a novice gardener! Thanks. When pruning, start from the top and work down up to 1/2. You don’t have to prune it that much or at all. It depends on how large your plant is, and if it is manageable to move indoors. You can always prune in late winter before it starts to grow again. A 10-20-10 fertilizer will stimulate blooming during the summer. Generally, you should stop feeding your plants during the winter unless it is still growing and blooming, then use 1/4-1/2 dose of recommended feeding. Thanks for the tip about buying mandevillas now. I’ll check around this weekend. Where can I find a mandevilla? Many local garden centers cary Mandevilla. If you live in a cool climate, your chances of finding a Mandevilla are better in late spring. Check your nursery/garden center, they may have some at a reduced price this time of year. Thanks again. We have had intermittant deluges of rain mixed with drought this summer. So, it has been rather difficult to maintain healthy plants. But I will definitely use nitrogen on my mandevillas. Is it safe to use nitrogen on my other landscape plants, as well? Use a balanced fertilizer such as 10-10-10 with micronutrients, which will provide the nutrients needed and can also be used on other landscape plants. I’m back. I found your website last year, and managed to begin overwintering two mandevilla(s?). One died during the winter, and the other survived, and actually made it back outside in the spring. Then it slowly croaked. I now have a beautiful rambunctious pink one that is happily growing all over the place. So, if I’m reading these posts correctly, I should be feeding her 10-10-10 now (or am I still at the higher middle number now?. I should detangle and disengage her before the first frost, give her a good washup, and a trim (she has long vines), and then spray for bugs before bringing her in. I can (possibly) try to root some of the trimmings. Then I should put this one in front of the sunny East window where the plants thrived last year. By the way, I live in Maryland. Did I get it straight? Please advise. Sincere thanks for your help. Yes, you got it straight. Hopefully you will have great success this year. Use the high middle number fertilizer at a 1/2 dose and then stop feeding when you bring it indoors. Place it in the sunniest window. See Propagate Mandevilla from cuttings. I live outside New Orleans and have enjoyed my mandavilla vines and hanging baskets all Summer. The leaves on my mandavilla trellis (which faces the south)are beginning to yellow from the bottom up. Could I be overwatering the plant? I fear losing this beautiful focal point! Thanks much! Have you been fertilizing the plant during the summer? Yellowing lower leaves can be a sign of nutrient deficiency (Nitrogen). If the leaves are turning yellow and brown and dropping then you may be overwatering. You might be watering the plant too often. Give it a good soaking in the morning and if the soil is dry 2″ down water again. Try to avoid watering in the evening unless the plant is wilting or extremely dry. In extreme heat, move the plant to a shaded area until temps cool down a bit. You need to keep them just moist enough to keep the soil from drying out completely. The insulated container may work to keep them dormant for the winter. Another way is to bring them indoors and grow them as houseplants. Can i divide my mandavilla into 2 plants? Mandevilla can be divided. It should be done when the plant is dormant or not actively growing. I have two beautiful mandivilla plants that are in large pots on my deck. These plants had flowers when planted but now I have no flowers. The plant is growing nicely and generating vines. I have fertilized the plants with a slow release fertilizer. but no buds are being generated. How can I get the plants to generate flowers? The plants I had last year were fine and they were located in the same location . .
We live in northern New Jersey. Thanks for any help you can provide. What kind of fertilizer did you use? During the growing season you should feed it with a 10-20-10 (high phosphorous) fertilizer every two weeks. If it gets too much nitrogen (1st #) then it will produce lots of leaves and no flowers. Another possibility is that the plant was set back from planting and because it blooms on new growth it now needs to put on healthy growth to bloom again. I’m assuming that you are refering to Celcius minus 6 that equates to 32F. You can try planting it outdoors and protect it for the winter. It will loose all its leaves but may grow back from the roots. Mandevilla is a tropical plant and tolerates minimum temperatures of 45F (7.2C) anything below that will cause its leaves to drop. I just bought a new mandevilla cause the first one died instantly and I want so much for this one to survive and grow I live in San Antonio, Texas could you give me some key points on how to care for this plant and where would be a good spot for it. On one side of my house is pretty much direct sun and the other has lots of shade which would be the best for it? The sunny side would work best. Mandevilla, need lots of sun but before you expose it to so much sun give it time to acclimate to the high light by moving it slowly into that exposure. Also make sure you keep the plant well watered in hot weather. I live in Fair Oaks Ca and just bought 2 trellised bright red flowering “dipladenia” vines. I googled and now am wondering if I have a “mandevilla” or are they one in the same. Is my location going to require overwintering or just mulched & blanketed for the occasional frost; and, what about our sometimes heavy rains in the winter? ; it can get quite hot in the summer, so what light exposure will be best for this location? I believe I am in zone 9?? Mandevilla belongs to a large family that also includes plants that were formerly known as Dipladenia. Dipladenia is the shiny leaved plant and Mandevilla is the crinkly one. Both are referred to as mandevilla. It is hardy in zones 9-11 and tolerates minimum temperatures of 45F. It tolerates full sun to part shade but in hot area part shade will work. I have a puppy that loves to eat my mandevilla flowers or leaves. I cannot find out if mandeville is poision to them. I cannot seem to break this habit no matter where I put my plant he seems to be attracted to it. All parts of the plant are considered poisonous when eaten. (www.ces.ncsu.edu) It may not kill the puppy but can make it sick. The sap can also be a skin irritant. I live in SW Florida, just outside Ft Myers (inland) to be exact. I have 5 Mandevilla that are inground. I covered them this past winter when the temperature dropped to 27 for a couple of nights. They survived and I have been trying to root cuttings from the different colors I have with no success. I take a cutting about 6 to 8 inches long from the new growth, use a root stimulate and place in peat pots in my garage under grow lights. After about 2 weeks the cuttings start to turn brown at the base while the tops remain green. I keep the potting soil moist. The outside temps range from 70 to 90’s this time of year while the garage is much hotter. What am I doing wrong? The best time to propagate mandevilla is in the spring but cuttings can also be taken in summer/fall. Take 2-3 â€ tip or side shoot cuttings that have new growth that is beginning to firm (not new light green growth) remove all but 2 top leaves. Dip the cuttings in rooting hormone and place in sandy peat soil mix. Keep moist and humid with bottom heat of 68-77F (20-25C). Keep in shaded area, out of direct sunlight. It may take 20-70 days to root. Your cuttings may be getting too warm, try using a different soil medium. If you take softwood cuttings(before new growth begins to firm), remove the soft tip and lowest pair of leaves. When inserting into the medium predibble the hole and insert cutting, then gently firm around the stem. Try watering in with a fungicidal solution to avoid fungal infection. So glad i found this site. I just got my mandevilla today, i live in Ohio, so from what i have read so far, i should leave it in its pot and bring it in on cold nights, and thru the fall winter ( i def. want to keep this one, fell in love with it when i seen it) I have a large picture window that i can put in front of during the fall winter months and during the spring days i will take outside, and just bring in during the night. is this all ok to do? Mandevilla is a beautiful plant. Yes, that’s exactly what you need to do. When night temps are in the 50’s you can leave your mandevilla outdoors for the whole summer. Mandevilla is a tropical plant that is hardy in zone 9-11, Kansas city is in zone 6. It will not survive the winter outdoors and will have to be brought indoors. Wow, I am so glad I looked this plant up online and found this website. I live in PA, just brought a pink/red mandevilla and was going to put it in the ground tomorrow. Is it better to leave it in the container it came in, transfer to a bigger one, or can it be planted in the ground? Also,the area i brought it for, is primary shade, is that a bad idea? Mandevilla is a tropical plant, if you plant it in the ground you will have to dig it up in the fall and bring it indoors for the winter. Leave it in the container. If there are roots growing from the bottom of the pot and the plant is pot bound, then transplant it into a larger container. It likes full sun to part shade, therefore I would place it in a sunny spot for the summer. I overwintered two Mandevillas (dormant in a cool basement). In March, I brought them upstairs to warm them, gave them some water and put them near a sunny window. The pink Mandevilla is slowly sprouting new leaves from its old stems. The red Mandevilla started to send out tiny little shoots around the center stem near the base (these did not grow along its old stems like the other Mandevilla). Then all the tiny, little green shoots disappeared on the Red Mandevilla, withered away. Now, all I have are brown stems left over from last Fall. I tried scratching at the stems and they show no green, the end pieces just snap like dead wood. If the roots still have some life, is there anything I can do to get this red Mandevilla to resurrect? If I recall, the red Mandevilla didn’t need full sun. Maybe it’s getting too much sun? I now have them outside on 60 -80 degree days. It sounds as if the red mandevilla didn’t make it for some reason. If the roots are alive they may send new growth from the soil, you’ll have to wait and see. I am going on my fifth season with a red flowering mandeville in the Boston area. It was very pot bound and desperately needed re-potting. I was told to cut the roots back to the main root, prune back the top growth, which was spotty by now, and fertilize. I found it had several large tuber type roots growing on the sides and bottom- which I left intact. It is re-situated in a larger pot and moved to a glass paned screen porch for the spring and will go outside in May. I thought with all the pruning and root reduction that it should rest before I fertilized it so I did not fertilize – do you recommend that I do? If so, what type? I have three other younger mandevilles, whites and pink- I am amazed at the amount of neglect this plant will tolerate and still bloom each summer. It even attracts hummingbirds! I’m so glad I found this site. Wow 5 years of wintering-that’s great! I would wait on fertilizing until you see new growth, then feed it with a high phosphorus fertilizer 10-20-10 in spring and during the summer. Hi I appreciate your help I got last Sept 09 on my new mandevilla. I live in Colo; I stored in soil in a plastic container with lid on it. Also tried to moisturize it every month. When should I slowly get it acquainted with the outdoors? We’ve had a late winter, in fact just got up to foot a snow in drifts last week but melted it fast in a day. Thanks for your help! Happy Easter & Spring! Your mandevilla should be starting to show signs of new growth. Slowly acclimate it to brighter light by increasing exposure each week. When outdoor temperatures are above 55F move your plant outdoors for the day but make sure you bring it indoors at night. You can leave the plant outdoors when night temps are in the 50’s. Thanks for the advice, I will get them out as soon as it warms up. This is a wonderful site , so helpful! Hello, so excited that I had found this website its so full of great info and has been a great help to me. I purchased my plants in summer and had beautiful blooms all summer into fall. I brought them in during fall and began to winterize them. This site helped me winterize and learn so much. I placed them in my house in full sun all winter and checked them daily. I would water them when they looked dry and a lot of leaves dropped. In early spring I would begin to mist them w/ water. They are producing long strands of new greens and others with dark green leaves, seems very healthy . Im guessing they survived the winter and I did it all correctly! I live in PA, can you tell me if its time to start fertilizing them yet? When it warms up even more do I begin to take them out little by little and return them back to the house until it gets warmer? Thanks sooooo much for the advice, its been a great learning experience so far!!!! I’m soo glad you’re enjoying the site and learning. Great job wintering your mandevilla! Now that your mandevilla is starting to grow, you can feed it a 1/2 strength dose of fertilizer. Slowly start taking it outdoors when day temps are above 55F, this will help acclimate it to brighter outdoor light conditions. Do not to place it in full sun, the first few weeks outdoors, start with shade/part shade and slowly increase sun exposure. Make sure you bring it indoors at night. When night temps are around 55F, then you can leave it outdoors and feed it with a full dose fertilizer. I live in Madison, WI and am overwintering my mandevilla for the 2nd year. I’ve noticed both years that there’s a linty-looking fuzz on the new leaves when they form. I don’t see any bugs, but is that what is making this linty looking fuzz? The plant doesn’t seem to be harmed but I don’t want insects getting on my other plants either. The plant is producing long tendrils of growth and still flowering. Should I leave well enough alone or spray something on it? If you are not seeing any insect damage, then the lint is normal. Some leaves produce fuzzy hairs on the leaf surface as they open. A type of protection for the leaves. As the leaves mature, the hairs disperse. You notice it more indoors because there is no wind to blow the hairs away. Leave well enough alone. It’s possible that your Mandevilla is dormant. They drop their leaves in the winter and will regrow in the spring. If they don’t show new growth when the weather warms up, then you’ll need to cut back the dead vines and hope they will grow from the roots. Do not fertilize the plants in winter. Since they are in a “resting” stage they are not able to utilize the fertilizer. Hopefully, they will return in spring. Help. I brought my Mandevilla vine in the house for the winter and today noticed that there are tiny yellowish bugs all along the vines. What are they and how do I get rid of them. Thanks. I’m not sure what type of bug you have. I need more info. Are they oval shaped and bunched up in clusters? Are they soft bodied that can be squished? Could be aphids. I have left my plant out and it has been through several heavy frosts….looks dead. If I dig up the tuberous looking roots, can I plant them in a pot in the garage over the winter? Will it grow and bloom again next Spring? I’m not sure what will happen. It depends on how much frost damage they had but its worth a try. I’m about to feed my mandevilla before bringing it in for the winter, and will keep it in a sunny spot, not letting it go dormant. But I’m confused about which food to use when. I have some 10-54-10 and a more balanced food which is 10-10-10. Which food is better for winterizing, and which is better for new growth and lots of blooms next summer? Feed your mandevilla with a 1/2 dose of 10-10-10 just enough to help it through the winter. Once indoors do not feed your plant until early spring. Inside it will be in a much lower light environment, may drop some of its leaves and grow much slower. Use the 10-54-10 in spring after the plant puts on new growth. Thanks for all of the info! We live in Richmond, Va and I gave my mother a Sun Parasol Crimson Mandevilla (Sunmandecrim is part of the discription). We plan to bring it inside as suggested above, etc. BUT the plant’s info /care instruction tag says this is an annual. Does that mean we bought an Annual version of the plant OR is that just becuase it is a tropical plant and not expected to come back unless it is brought in. We will be extremely dissapointed if this variety is actually an Annual and cannot be saved. Do you know? You answered your own question. Because it is a tropical plant, it is considered an annual, that’s why you need to bring it indoors for the winter. With a little care, your mandevilla should survive the winter indoors and perk up in spring. Happy indoor gardening! I have a mandevilla and it is not doing too well. I live in Louisiana, I have it outside partly shady and it is spiraling up my porch rails. It usually doesn’t get too cold around here till January. It still is just growth, no blooms. I have fertilized it with miracle grow several times and still nothing. What should I do to help it grow and stay alive during the winter. I don’t have a green thumb, but it was one of my mother’s favorite plants before she died so this year I decided to buy me one, but I just can’t seem to keep it blooming or growing for that matter. Thanks for your time. Mandevilla needs 6-8 hours of direct sun to bloom well. If it is in shade it will bloom less. Make sure you protect the roots with mulch before the cold season comes. Remember it is a tropical plant and a freeze can kill the vine. If a frost is predicted, cover the vine with a blanket. It may drop its leaves from the cold but the roots will survive (depending on how severe the frost was). I’ve been reading your replies with much interest. What are my chances of saving an in-ground Mandevilla in Oklahoma City? We usually have a mild winter, but will get at least 2 bad blasts after New Year’s. And I read in one of your replies that these bloom on old wood, so could I take this year’s vines, and either mulch and/or cover with a large bell jar after I mulch the roots? Not to leave the glass on all winter, but intermittently, when the weather goes sour? Or will the one or 2 blasts be enough to snuff this plant? Thank you! One freezing winter blast will kill the plant. It sounds like more trouble than its worth. Store the mandevilla in the garage/basement, it should have a better chance of survival. I have a mandevilla that I winterized last winter and it’s healthy except that it did not bloom for me this summer and it also took all summer for it to grow. I fertilized but still no blooms. I bought a baby plant in the spring and that one took off beautifully. So, now I need to winterize both plants to a “dormant stage”,but while the plant was in so call dormant stage it developed pale new growth. The weather was still not ready for outdoor exposure. Can you give some tips on how to deal with that issue if it happens again? By the way love this site! The plant will develop some spindly growth if it gets light and too much moisture. If you store it dormant in a cool, dark place then you should not get any growth. Also water once a month – just enough to keep the soil from totally drying out. Because Mandevillas bloom on new growth, they need to put on good healthy growth early in the season in order to initiate blooming. Some Mandevilla are slow to start when they are rootbound from last years growth. You may need to replant it into a larger container or at least replace half of the existing soil and trim back the roots. In addition, cut back the plant by 1/3-1/2 in Feb/March which will stimulate new healthy growth fit for blooming. Weak, stindly growth will produce less flowers. Provide full sun and fertilze like you have been. Hopefully, this will jumpstart to an earlier bloom. I have a mandevilla that’s new to me & it has new growth at the bottom but the top is turning brown. Should I cut it back or wait? I have given it Miracle Grow & pest ridden it when I brought it in for winter. It didn’t bloom for me either this summer.Thanks for your help. Was the plant exposed to cold temperatures? Is that why the top is turning brown. If so, cut off the browning stems and allow the new growth to grow. If you plan on keeping it as a houseplant, place it in the brightest window in the house. 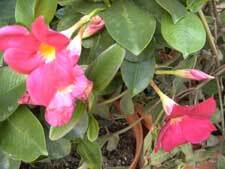 See the article on wintering mandevilla for more information. Next spring, when you bring the plant outdoors, place it in a sunny location and fertilize it with a well balanced fertilizer (10-10-10) so that the vine puts on healthy new growth which should stimulate flowering. I have read all the entries of this post, and I thank youvery much for the clear, precise information. I live in southern central Maryland. We were forecast to hit the 40s – 30s last night, so I btought in my two mandevillas. One is in a pot, so I understand what to do. I dug the other one up, and brought it in. My question is what type of soil should I use for the one that was in the ground? It gave beautiful red blooms all spring/summer, but never vinde. It has plush low growth. I’d love for it to survive the winter indoors. They will both live upstairs next to an East window. Thanks for any help you can offer. Replant your dug up Mandevilla in a good potting soil mix for houseplants. The outdoor soil will not do. It may drop some of its leaves due to lower light conditions. I live in Ontario Canada and bought 2 beautiful plants this summer. I have just brought them inside and wrapped them in plastic bag ( dry cleaner plastic film) I have been reading your site and you talk of treating for insects.. A friend told me to wrap in plastic and spray for bugs and leave bag on for a few days. Is this correct procedure for Mandevilla plants? What do I spray for insect? The plants are thriving and in full bloom again. I can leave them in sunny location so do I need to trim them back? The plastic bag is a good way to treat for bugs but be sure to keep the plant away from sun during that time. I prefer to take them into the garage or outdoors and spray. If there are any insects, a safe insecticidal soap should get rid of the general bugs. Keep an eye on the plant during the winter for “newcomers” such as spider mites or scale. Since the plant is thriving, place it in a sunny winter and enjoy. You don’t need to prune back. As winter progresses, it will slow down growing and blooming. You can always cut it back in early spring to remove spindly growth. I live in Fort Wayne, IN. We have very very cold winters. I want to make sure that if I put my plants in the garage over the winter since I do not have room in my house for all of them. Do I need to prune them down 1/2 the size or to what? Also since I would like to keep them in the garage do I need to cover them? Do I need to do anything with the soil? Then how often in the winter should I water them? I brought my potted Mandevilla’s in lastnight to protect them from an early frost. We had a few house flies and a WASP flying around the room by morning. I had planned to leave them inside for the winter. What’s going on? Hello, I live in Michigan and it snowed today. I thought I was resigned to my mandevilla dying in the winter, but when I looked outside to see snow and my plant looking wilted I freaked and brought it inside. The leaves are still green and the flowers were doing ok till today when it snowed. Now all the flowers and buds are hanging, the loose vines look wilted and the leaves on them are dead, but the leaves on the main plant are still green. My mom says the whole thing is probably dead and just not showing it yet. Is there a way to know if the roots survived? I know it’s probably too late, and I didn’t even plan to keep it over winter, but it was such a beautiful plant . . . any help would be appreciated. I don’t think the roots are frozen yet. Bring the plant inside, cut off all the dead stuff and store it in the basement (dormant ) for the winter. It may surprise you and grow next spring. If you want to test the roots. leave the plant inside in a sunny window and see if it sends out new growth. You don’t need to cut it back for winter, if you keep it as a houseplant. Mandevillas are cut back when they get too large and are unmanageable indoors. If you plan on storing it in a dormant stage, then prune it down. This will give insects less area to infest. I live in Southern California, Beaumont Calif.. I just bought two Mandevilla Giant White plants. I want to plant them outside, to vine on the block wall. bring them inside in winter, when it rains hard or gets cold at night? As long as temeperatures do not get below 40F at night, your mandevilla can be left outside. If a cold spell is eminent then cover the plant with a blanket. Mandevilla is a tropical plant and will not survive outdoors in Indiana. Either you dig it up or kiss it goodbye. Once your mandevilla is exposed to freezing temperatures, it will drop its leaves. You can bring it indoors before it drops its leaves and either keep it in a sunny window or store it in the basement. It will eventually drop its leaves from low light once it is in the basement. You can also trim the plant back up to 1/2 for storage purposes. It’s better if the roots have some protection(soil) around them to keep them from drying out. What if you planted the Mandevilla in the plastic box for the winter? I haven’t tried it but it would function the same as a pot. Make sure you water once every month or so to keep the soil from completely drying out. Yes, you can cut your mandevilla back to make it manageable indoors. Place it in the sunniest window in the house. I have just read every one of your questions and your answers. This one I did not see. I live in the NorthEast Georgia area. Zone 8 I believe. My 3 Mandevillas are on the top of a small hill outside the pool. the chain link is what they grow on. I water every day. It has good drainage and they are so pretty they dont even look real. I have the thicker leaf type. We have a harbor near the vines with several electric plugs. I just got 3 clip-on heat lamps with the heat bulbs that will clip on to the top of my fence shooting down on each vine. Can I mulch as you suggested, cut back the vine and cover with plastic at night with the heat lamps shooting down every night and only take plastic off when the sun gets to 45 degrees durring the day? If the day does not get above 45 can i keep the plastic on with the heat lamps? Sounds like a lot of effort on your part. I’m not sure if its worth it. Go for it. I would cut back the vine, mulch heavily 4-6″ in Dec. (coldest part of the winter) and hope for the best. Let us know how you did. I fertilized regularly with 12-4-8. Should I try it again this year and use 10-10-10? Use a fertilizer formulated for flowering plants such as a bloom boost which is 10-50-10. The middle number is crucial to promoting flowering. A higher first number which is Nitrogen will promote leaf growth at the expense of flowers. A balanced fertilizer like 10-10-10 is better than what you are using. Don’t give up on your mandevilla. Give it a bloom boost this year and see if it will respond. It will probably bloom when you bring it back indoors. We learn from trial and error which makes us better gardeners. I live in Indianapolis and I winterized my Mandevilla last winter as you recommended. This past summer I took it outside and it returned to a big, beautiful, full plant with georgeous leaves but never bloomed. What have I done wrong and is it worth trying again? Thanks for your help. Did you fertilize your mandevilla? If so, what kind of formula (10-10-10)? I have a question: I just bought a mandaville vine and planted it outside so it could climb up on my porch. I have been reading the other comments about bringing the plant inside for the winter. I live in Wisconsin and I am wondering if mulching the vine heavily in fall and then placing a rose cone over it wouldn’t be enough protection from the harsh winters we can get here. Or should I just dig it up and bring it in the house for the winter. Please advise. Mandevilla is a tropical vine and would not survive the winter cold, even with heavy mulching. I think you will have to dig it up and store it indoors. Hi I just purchased a Mandevilla from Walmart, I just fell in love with it. I live in Michigan and was concerned with it being a tropical plant, if it will go into a dormant stage before I bring it into the house for winter. What will be a good insecticide that will also be safe for my pets? Your mandevilla will continue to grow when you bring it indoors, unless you expose it to cold temperatures where it would drop all its leaves. Otherwise, if you bring it indoors and place it in a sunny room, it will continue to grow. The insecticide you would use on the plant is dependant on what’s “bugging” the plant. A general safe insecticide is insecticidal soap or a soapy water solution. Here’s a recipe for a general spray that I found: Blend 1 garlic bulb and 1 sm. onion. Add 1 tsp of cayenne pepper. Let mixture stand overnight and strain. Should work on some insects. Keep away from eyes and skin as it can burn. Wear rubber gloves when mixing. I have not tried this one. You can try it but I think mandevilla is more cold sensitive than calla lily and may not survive. This is my first mandevilla and it is beautiful but this past week we have had a tremendous amount of rainfall. My plant is really drooping and not flowering. We finally discovered there are no drain holes in the pot. We did poke several holes for drainage. Is this the reason for the drooping leaves? If the soil is wet and the plant is droopy, then the problem may be root rot from too much water. If the roots were wet for an extended amount of time then they may have root rot. Let the soil dry out and see if the plant improves. The roots may or may not recover. I should have looked this up earlier! I just bought a Mandevilla from walmart and I also did not know they were tropical. I fortunately haven’t yet planted it so I have a few questions. I live in Lovettsville, Virginia and I have a huge sun room. Lots of windows! Would a mandevilla make a nice indoor sun room plant or should I just go buy a container and have it outdoors during the summer and bring it into the sunroom for the winter? What size container does one need to keep this plant in? Is it going to become overwhelming? Thanks for you help! i bought two mandevilla’s 4 months ago. they looked like they were too crowded, so i repotted them in bigger pots and put 6foot pieces of small fencing for them to grow. my flowers are growing very viberant and wild.this was the best thing for me to do. I have never had a green thumb but these flowers has made me understand gardening better. can i divide my mandevilla’s to have more potted plants? I’m glad you’re enjoying your new mandevilla. You can divide it, IF you have two distinct areas in the pot to divide. i live in tucson, AZ will the madevilla survive our winter? thank you! Tucson, AZ is in zone 8, Mandevila is hardy in zone 9-11 and with stands minimum temperatures of 45-50F. The roots may survive the winter with added mulching but the top of the vine may die back from any cold spells. Planting it in a protected area will also help. The best way to check if it will thrive is to check the neighborhood for anyone else growing mandevilla. I got a Mandevilla as a gift and I live in Hattiesburg, Ms. Can I plant it in a big pot and prune it like a bush or is it best to plant it in the ground with a trellis and cut it back to the ground each year? Which ever method is more convenient for you. Mandevilla is a vine, it will be difficult to maintain it as a bush. It needs to vine to produce new growth to bloom. I brought my Mandevilla into the house for the winter and placed it under a gro lux light. I leave it on all the time. Many of the leaves are drying up, but it is putting out many small long vine like growths. How much should I water it , and how much, if any, should I prune it , and what about the new vines it is putting out? Enjoy your site and appreciate your comments/advice. Your mandevilla will shed some if not all leaves indoors because of low light and adverse growing conditions. The gro lux light will help supply more light and encourage more spindly growth. You can leave the new growth or if it becomes unmanagaeble trim it as it will need to be pruned off anyway in early spring . Water less in winter. Check the soil once a week for moisture. I am in ontario,canada, i bought my Mandevilla in when it started to get cold, it was doing really well now my leaves have black spots on them.What am i doing wrong? Black spots on the leaves can be caused by a fungi or bacteria during the growing season. At this time of year your mandevilla may be responding to drastic temperature change or overwatering. Also check for insects, if you have an infestation, treat accordingly and remove any spotted leaves. With lower light conditions indoors, mandevilla will most likely drop a lot of leaves if not all, sulk and produce some spindly growth which will have to be cut back in spring. So if you have an insect infestation, trim the plant up to 1/3 now which will make treatment easier. I have read the tips about winterizing but I live in North Carolina and have 3 beautiful madevilla vines planted in the ground climbing my back fence. There is a pretty large looking root system. Since the odds are against it surviving the winter outside, can I dig them up, pot them and then winterize in the garage as has been suggested. Will this be too much stress on the plant since i will be cutting off some of the root system? Yes, you can dig them up and put them in pots. It will be stressful on the plants, they may even go dormant and loose all their leaves for the winter. North Carolina is in zone 7-8 and Mandevilla is hardy in zone 9-11. If you are closer to zone 8, you can try an experiment and “push” the hardiness by leaving one of your mandevillas outdoors and heavily mulch the roots later in the season to keep them from freezing. The vine will drop its leaves and dieback in colder temperatures but your plants roots may survive the winter. If it’s not too servere. It’s another option. I certainly appreciate all the wonderful information on winterizing the mandevilla, but I did this last winter and found that come spring, late spring, early summer I had no flowers. It wasn’t until late August that I got beautiful flowers, but I am hoping I can do something this year to promote earlier blooms. My plants are now perfect, but soon I will lose them with a frost. Help!! and thanks. I don’t know how much you trimmed the plant in the spring, but don’t prune it more than 1/2 because mandevilla blooms on old wood. The more you cut back the longer it takes. In the spring, try fertilizing as soon as new growth begins-see if that makes a difference. I live in Shreveport La. During the summer I grew a beautiful Mandevilla on my trellis. Winter will be here my late December, my ques is should I cut back the plant and just mulch the roots at the base? and will it come back? You are in plant zone 9 and Mandevilla is hardy in your area so it should grow next year. You don’t need to prune or cut it at this time. Leave it as it is. Mulch the roots at the base when the weather get colder. Cut your plant back in late winter/early spring to shape or remove any winter damage. You can cut back as much as 2/3 of the plant and it should bloom on the new growth. It needs to put on 1-2 ft of new growth to start blooming. I am in Ohio and bought 20 Mandevilla Trellis plants at Walmart and planted and spaced them around the fence surrounding our pool. I wanted something that would vine and cover the fence and get thicker and thicker. Now I find out they may not survive the winter. I can’t dig them up and bring them in because they are vining beautifully and giving the privacy I wanted. I am mulching them heavily before winter. Will I have to start from scratch each year or will they be bigger each year? As soon as frost hits the air, your mandevilla vines will turn black and drop all its leaves. Chances are slim that the roots will survive the winter, if they do it will be an uphill battle each year. It’s a shame that no one informed you at Walmart that they are not hardy in Ohio. Hi! I overwintered my mandevilla in the same pot it was in last year. Now it is back outside and looks great: bushy with lots of glossy green leaves and it is growing like crazy. But there are no flowers! I fertilize weekly but I did not change or add any soil to the pot from last year. Any tips to encourage blooms? You may be fertilizing your mandevilla too much nitrogen causing more leaf growth than flowering. Feed it with a fertilizer that is higher is phosphorous (middle #) 10-20-10 or a bloom boost.Mandevilla also needs to put on a foot or two of new growth to start blooming. To re-plant my mandevilla amabalis outside in the summer, should I remove the dead stalk from the bulbs? Presently there is no growth after it successfully grew inside all winter. It’s always good to remove any dead material as it serves no purpose other than attract disease. Your mandevilla should have some new growth by now; a vacation outdoors should get it started. After re-potting place it in a shaded area for a week to avoid transplant shock. Warm temperatures, humidity and fresh soil should get it started. I winterized my mandevilla. Now I have put it outside. How long will it take to see new growth? Right now it looks completely dead. If your mandevilla survived overwintering, it should be showing some signs of life with warmer temperatures (60’s). Scratch the bark on the stem and see if there is some green, if so then it may still have some life in it. If brown and dried up then it may be dead. Cut back the dried up stems and water to see if any new growth comes out from the roots. Thanks for all the info I have My mandavillas in the green house for the winter I live in Thomasville GA . Dont you think mandavillas should be okay here for the winter in the ground cut back and mulched heavy? Most mandevillas are hardy in zones 9-11 you are in zone 8 possibly 9. If grown in zone 8, it can die back from a freeze but will grow back from the roots in the spring. Heavy mulching and planting in a protected area would definately help in overwintering outdoors. You can also cut back any winter damaged stems in the spring. Yes, you can store them the dry root method. Check on the plants periodically for moisture, so they don’t dry out completely. A box or styrofoam cooler will also work, place the box in a plastic bag. The one thing you have to be aware of in garage storage is drafts and drop in temperature when the door is open on a very cold day. It is a tropical plant hardy in zone 9-11. In zone 8 it will be killed by frost but can grow back from the roots. Mandevilla tolerates a minimum temperature of 45F. Any lower temperature and it will drop its leaves and at freezing die back to the ground. After a frost mulch the plant heavily, cover it with leaves, straw or evergreen branches -this should protect the roots. With any luck, if the roots don’t freeze then it should come back in the spring. The other option is to dig it up and winter it over in the garage in a dormant stage. Winterize Mandevilla – Hi, I live in Austin, TX and planted 5 mandevillas outside, they are thriving…we are now expecting one additional and unseasonal frost in April, with rain and temps at 35-40 for lows…what should I do? This weather is crazy!! Cover them with a blanket or any insulating material and hope the temperature doesn’t drop below 32 degrees. Covering them should help them survive the brief cold spell. Let the plant stay outside as long as possible, the stay indoors is long during the winter. They can stand temperatures in the high 40’s for a short time. Give it a light fertilizer (10-20-10) middle number should be high. This will prepare the plant for the winter. In a few weeks when it starts to really get cold, bring the plant in and prune it back down to about 12 inches above the soil line. Keep it in the brightest spot in the house to just maintain the plant. You will get some leaf drop due to lower light and humidy indoors. Keep it on the dry side during the winter. I am in Austin,Tx. I have a young Mandevilla in a 1 gallon pot. Should it be put in the ground and mulched, or placed in a larger pot and wintered over? You are right inbetween. Austin is in zone 8b. Most mandevillas are hardy in zones 9-11. If grown in zone 8, it can die back from the frost but will grow back from the roots in the spring.Depending on how much die back occurred it may take longer to start reblooming. Mulching would definately help in overwintering outdoors. On the safe side, indoors or a garage will work. It’s your call. If you decide to keep it indoors wait for spring to replant it. I just purchase a mandevilla trellis and did not realize its a tropical plant. I live in Richmond Virginia and wanted to know if I can plant it in the ground outside? Would it come back in the spring? Any suggestion would be greatly appreciated. Mandevilla is hardy in zone 9-11 some 10-11, you are in zone 7? where min temperatures are 0-5F. It will not tolerate freezing temperatures. If grown in zone 8, it will die to the ground and come back from the roots. IF, you decide to plant it outdoors put it in a protected area and mulch heavily after a cold snap kills off the plant. The mulch will protect the roots from freezing allowing it to come back next year. It’s risky but may work. Your other option is to winterover your mandevilla where temperatures are above 50 degrees. I will be keeping my Mandevilla in a greenhouse for the winter. Do I still need to cut it back if it is kept at a higher temp with more light? You don’t need to prune your Mandevilla if it is in a greenhouse. One of the reason why you cut it back is to keep it in a manageble shape indoors. It’s also easier to control insect infestations when they occur. Mandevilla blooms on new growth so you don’t have to worry about not getting any flowers after you prune. If you don’t cut it back in the fall, trim crowded stems and old wood in the spring before setting it outdoors. It will produce vigorous growth and a bushier plant. I have a Mandevilla vine also and have read the comments on cutting back for winter…my fear is that cutting it back so much will kill it. I have a large, bushy vine in a pot wrapped around bamboo stakes to give it the bush shape and then on a trellis too . If I cut it all back to the 12 in., is there a chance I will kill it? No, you will not kill the plant. Mandevillas are tough plant and take to severe pruning. It’s better to cut them back ,if you don’t you will have a tangling, vining mess on your hands when they start to grow in the spring. A pruned plant is easier to control indoors. You can cut it back to 1/2 of its size . I have a huge trellis of Mandevilla….I live in Pennsylvania…what do you suggest on covering it outside when the temperatures drop. It is so big it would be impossible to bring it in. Mandevilla is a tropical plant and can not tolerate temperatures below 40 much less freezing. It will lose all its leaves as soon as frost hits. To have any slim chance of wintering over you will have to bury the pot and mulch heavily to protect the roots and some of the vine. The vines will all freeze and die but if you save the roots and part of the vine, it will regrow and bloom next year. If you can, drag it into the garage insulate the pot and wrap the trimmed vines in plastic, bubble wrap, etc. If the winter isn’t to harsh the roots might survive.